Somehow, I failed to share that back in October, my brother and I grabbed lunch at Mochiko. I had the Bento ($7.99) with the Sriracha Sambal Aioli. He chose the larger Ohana ($9.99) with Mochiko and Honey Dijon. The Ohana was more than he could finish. The Bento was more than enough for me. The meals have good value. I know rice is pictured, but get the seasoned fries, they are super delicious. The chicken is juicy and white meat (big props). Some pieces were a bit tough - that was our only complaint. The breading is crisp, but not greasy and it has good flavor. I really enjoyed the heat from the Sriracha and Mike chose the mochiko as his favorite sauce. I loved the Asian slaw! That alone will bring me back. The lychee lemonade is unique, it's definitely on the sweet side so be forewarned. Service was warm and friendly and the space was clean. Since, then, we've been back half a dozen times. We took a brief hiatus after they discontinued their tenders. But now, they are back and better than ever. They've added more bowls and waffles to the menu. If you want to keep it a bit more healthy, they have grilled chicken bowls. I'm fond of the Srirachi ($7.99) you can add steamed veggies and a drink for $2 more. The chicken has great flavor and a nice char. 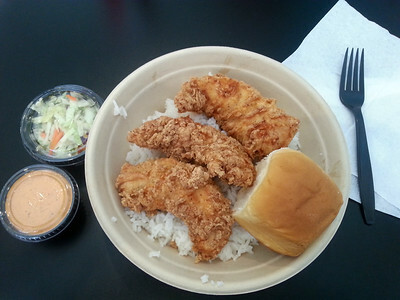 However, I must admit the fried chicken is where it's at, I recently tried the Spicy Mochiko Bowl ($7.99) and it was fantastic. If chicken and waffles are your thing they have it on special for $6.99. You won't regret trying the tenders, it's doubtful you've had them more juicy and the best part is no grease or heavy breading. With ten sauces available, you're sure to find a favorite.